False color image comparing graphene grown on pristine Pt (inset) and Pt with a silicide layer (main image). Credit: Nicole Grobert, University of Oxford. One of the challenges facing graphene before it can be widely adopted in devices — how to produce large single crystals in minutes rather than days — may have been solved by researchers at the University of Oxford and Oxford Instruments Asylum Research. The exceptional electrical, optical, and mechanical properties of graphene make the two-dimensional material attractive for a wide range of applications from flexible electronics to energy storage. But real devices require a robust, reproducible, and economical means of producing large flakes or layers of graphene. So, Nicole Grobert’s team at Oxford University has combined two promising approaches: atmospheric pressure chemical vapor deposition (APCVD), which is simpler and cheaper than conventional CVD, and the use of liquid metal growth substrate. Liquid metal substrates like copper are attractive because their surface is so smooth that it mitigates the effect of crystallographic features like grain boundaries or defects on the growing graphene. But so far, researchers have had little success controlling the nucleation and size of graphene flakes in this way. 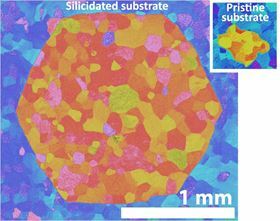 In the new approach, a solid polycrystalline platinum (Pt) foil substrate is covered with a very thin layer of SiO2 (or silicide), which melts when heated to form a liquid Pt-silicide layer [Babenko et al., Nat. Commun. 6:7536 (2015)]. The Pt-silicide mixture is a ‘eutectic’, meaning that it melts and forms a liquid at a lower temperature than either of its constituents. When graphene is deposited by CVD on top of this liquid layer, it grows ten times faster (at rates of up to 120 um min−1) than typically achieved on other substrates. The liquid layer also smooths over surface features, so that the graphene forms high quality, uniform hexagonal single crystals (as shown). In just a few minutes, the technique can produce single graphene crystals up to 2—3 mm in diameter. Grobert believes that the approach of using eutectic materials as a substrate could open up the way for the production of other two-dimensional materials as well as graphene at lower costs. Silicidated polycrystalline metal foils could replace expensive single-crystal substrates, while using thicker insulating liquid layers could obviate the need to transfer the graphene to another substrate before use. ‘‘This is a proof-of-principle study showing that high quality graphene can be made to the size and timescale that someone looking to build technologies might want,’’ says Grobert. ‘‘Our next step will be to exploit the technique to produce larger areas of graphene.’’ Even wafer-sized single crystals of graphene could ultimately be feasible using this approach, she hopes.